I had many doubts about publishing a Good News Friday post today. I felt that with the residents of the south under a a massive barrage of rockets, spending a large part of the summer holidays in their bomb shelters, it was hardly fitting to post a jolly Good News item. The ceasefire achieved last night has hardly changed my mind given that I think it is totally the wrong thing at the wrong time, and Hamas will simply take advantage of the breathing space to regroup and rearm. However, since for the moment our southern brothers are able to emerge from their shelters, I present you with this Good News Friday post, and maybe bring a smile to your hearts. Let’s start with some wonderful news from unusual places. 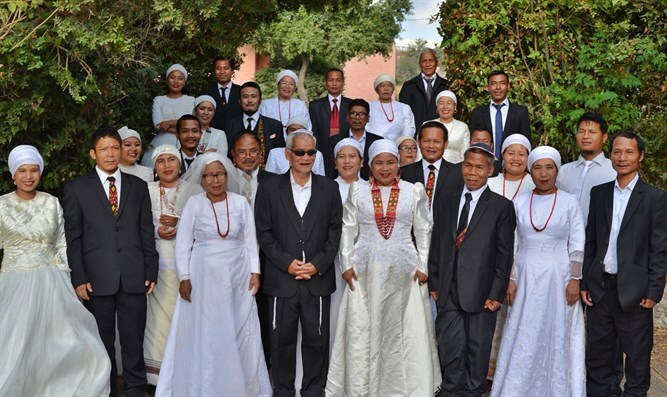 Fifteen Bnei Menashe couples, all of whom immigrated to Israel from Manipur, India, two months ago were remarried on Monday in a festive and emotional group ceremony. The ceremony was held at Shavei Israel’s absorption center in Kfar Hasidim, after the new immigrants had completed their formal conversion. “After realizing their dream of making Aliyah and returning to the Jewish people, these 15 Bnei Menashe couples now have an additional reason to celebrate,” said Shavei Israel Founder and Chairman Michael Freund. Among the couples who married were Sharon Hangshing (79) and Hillel Hangshing (80) from Churachandpur, Manipur, who have a married daughter and grandchildren living in the Israeli town of Migdal Ha’emek. The couple came to Israel with a widowed daughter and her two sons, as well as a single son. They left a daughter-in-law and her children behind. The Bnei Menashe (sons of Manasseh) claim descent from one of the Ten Lost Tribes of Israel, who were sent into exile by the Assyrian Empire more than 27 centuries ago. They believe their ancestors wandered through Central Asia and the Far East for centuries, before settling in what is now northeastern India, along the border with Burma and Bangladesh. Throughout their sojourn in exile, the Bnei Menashe continued to practice Judaism just as their ancestors did, including observing the Sabbath, keeping kosher, celebrating the festivals and following the laws of family purity. They also continued to nourish the dream of one day returning to the land of their ancestors, the Land of Israel. Over the past 15 years, Shavei Israel has made the dream of aliyah (immigration to Israel) possible for over 3,500 Bnei Menashe and plans to bring more members of the community to Israel. Currently there are 7,000 Bnei Menashe in India awaiting their return to the Jewish homeland. What fantastic news for the Bnei Menashe, for Israel and the Jewish nation. Kol hakavod to Shavei Yisrael for the extraordinary outreach work, and hearty mazal tov to all the new (old) couples! From another distant part of the world, a Maori group has apologized to Israel over New Zealand’s opposition to Israel at the UN. The article was written by Sheree Trotter, a Māori New Zealander, a researcher, writer and co-founder of Shadows of Shoah, a unique multi-disclipinary Holocaust exhibition. History was made on 29 July 2018 when the indigenous people of New Zealand organised a special ceremony to honour and welcome the Israeli ambassador, His Excellency Dr. Itzhak Gerberg. Led by Ngapuhi kaumatua (elder) Pat Ruka, and joined by many Māori from around the nation, a Powhiri (welcome ceremony) was held at Hoani Waititi Marae (meeting house) in West Auckland. The ceremony of apology, called a whakapāha, was held to express regret for New Zealand’s actions in standing against Israel at the UN and to seek forgiveness. Since Davidson’s 2016 Gaza flotilla stunt, increasing numbers of Māori have become more vocal and active in their support for Israel.With the Israeli Ambassador returning to New Zealand in 2017, Pat Ruka led an initiative to formally extend a welcome, offer an apology for New Zealand’s actions at the UN and affirm Māori friendship toward Israel. Ruka carries the stories of his tupuna (ancestors) who, because of their Christian beliefs, maintained a deep respect for the people of Israel. He remembers that his forbears travelled to the capital city, Wellington, to offer the government iwi (tribal) land for Jewish refugees following World War II. His tupuna were told to “go back to their hovels”. The afternoon event included the traditional elements of a Powhiri: the Wero (challenge to determine whether visitors come in peace or hostility), the Karanga (call onto the Marae), Mihi (speeches), Waiata (song) and performances by Hoani Waititi Kura Kapa Haka group and Pacific Pearls. Representatives of Auckland’s Jewish community participated in the ceremony by singing Hebrew songs in support of their speakers, His Excellency Dr Itzhak Gerberg and David Robinson, Honorary Consul for Israel.There was also an exchange of gifts whereby the Ambassador received a Korowai (traditional cloak) and a menorah was gifted to Pat Ruka. To conclude, the parties sat down to share a meal together. National MP Hon Alfred Ngaro, New Zealand’s first Cook Island MP, spoke on the paepae (orators’ bench) recalling his family connection to the Jewish people through his grandmother.Throughout the proceedings, many similarities between Māori and Jewish cultures were noted, such as the emphasis on whakapapa (genealogy), language and land. The event marked a significant milestone in the relationship between Māori and the Jewish community, and the connection of Māori to Israel. Kol hakavod to this Maori group for going against the traditional views both of their tribesmen and the national government. May their wonderful stance gain more traction and persuade more New Zealanders to see Israel’s side. Turning now to something completely different, in stark contrast to Hamas which holds its own children hostage and deliberately targets Israeli children, Israel does it utmost to protect and nurture its own children, even the most disadvantaged or sick. 🤖 USING ROBOTS TO MAKE ART ACCESSIBLE! 🖌️ 🎨 Last month, ALEH’s special education school in Gedera transformed its robotics class into an art program that makes painting accessible to its students with severe complex disabilities. After spending several months teaching the students how to control spherical robots with iPads, the special education teachers helped the students take the next developmental and creative leap to using the robots as brushes on a canvas. The spheres are dipped in washable paint and placed on the canvas. The students then use the iPad to control the spheres, creating lines, shapes and beautiful designs with every continuous finger stroke on the touch screen. What a wonderful idea! This “thinking out of the box” combined with technological advances can take these students to the next level in their development. Kol hakavod to ALEH! May they continue taking their students to ever higher levels of development. And finally, here is a fantastic story of an act of pure altruism (also via Reality): Kidney donations from unrelated people have become fairly well-known, but donating a lobe of your liver to an unknown recipient is something unknown. But here is the story of an Israeli woman who decided to donate a lobe of her liver to a child whom she did not know and had never met. The operation took place at Schneider Children’s Hospital in my hometown of Petach Tikva (where I have recently started my “second career” as a volunteer). Outwardly Michal Segal’s life looks happy and peaceful. She is the mother of five children, married to Barak, a doctor by profession, a manager in a large company, and lives in a spacious house in a settlement in the north. And yet one day she made a life-changing decision-to undergo a long and complex surgery to donate a part of her body to someone she had never known. Thus, Michal became the first person in Israel to donate a liver lobe for altruistic motives. On the evening of the operation she met the little boy to whom she is donating. His name is Krish, the son of Hatal and Jed, a pair of foreign workers from India. He suffers from the lack of an enzyme that prevents the liver from breaking down proteins and food, and since his birth can only eat special formulas. When the parents wanted to return to India it became clear that there were no suitable formulas, and in their village, near Goa, there was no one to look after his medical condition. Since then he has been waiting for a transplant. “We did not believe anyone alive would donate, we were really excited,” said Jed, Krish’s father. “She is not related to us, she does not know us, we have not seen cases like that, not even in India,” she added. The surgery, which lasted about 10 hours, took place at Schneider Children’s Hospital. In one room the doctors gently removed part of Michal’s liver and in the other room they disconnected Krish from his liver and performed the transplant. The complex operation ended successfully to the satisfaction of the doctors. If the liver is absorbed as planned, the parents will be able to return to India next year. “I feel such perfection that it was the right thing,” concludes Michal with a smile. There are hardly adequate words to describe the enormity of Michal’s act of altruism. Taking such a huge risk for an anonymous stranger is almost incredible. A huge kol hakavod is due to Michal Segal for her courageous decision, and also to her family for giving her the valuable support she needed. Kol hakavod too to the talented doctors and transplant team at Schneider Hospital. We can be so proud that we live in a country with such medically advanced facilities. I also wish little Krish a refuah shlema, a complete and speedy recovery, so that he can return with his parents to his own country healthy and strong. A tough night of red alerts and warfare in the South. For our constant care, for our constant checking where missiles fell, for our solidarity – for all of the these there are deep roots. In this week’s Portion, the following verse appears: רְאֵה אָנֹכִי נֹתֵן לִפְנֵיכֶם הַיּוֹם בְּרָכָה וּקְלָלָה (“Behold, I set before you this day a blessing and a curse”). It starts in the singular, “ראה” (behold), and then changes to the plural, “לפניכם” (before you). So does this verse speak about an individual or the whole nation? What is the reason for this grammatical change? Such wise words written hundreds of years ago are still relevant today in the 21st century. May our unity merit us to a Geula Shlema, the Complete Redemption. Until then may peace and quiet (real peace and real quiet) return to the South and to all of Israel. Tomorrow is Rosh Chodesh Elul, the month where we begin our journey of penitence back to (hopefully) complete Teshuva (penitence) by Rosh Hashana. I wish us all a Chodesh Tov and Shabbat Shalom to all. This entry was posted in indigenous rights, Israel news, Judaism, support Israel and tagged ALEH, Bnei Menashe, Good News Friday, Judaism, liver donation, Maori, medicine, New Zealand, Resolution 2334, Schneider Children's Hospital, special needs. Bookmark the permalink. A great post as usual!Mazal Tov to all the Bnei Menasheh couples!So heartwarming. I’m overwhelmed by the Maori people.How wonderful they are.A good example that New Zealand should follow.The articles about Aleh and Michal donating a lobe of her liver…what can I say?Such wonderful people living here in Israel. Shabbat shalom-hopefully a real shalom/peace especially for our fellow Israelis living in the south.May the month of Elul usher in peace and forgiveness to all Am Yisrael. Thank you and Amen to your prayers. I would be interested to know why the parents couldn’t donate a part of their liver to the boy. Usually, that is what you hear happening. That a parent donates to the child. Yes it’s interesting that the donation came davka from a stranger. Perhaps the parents have other health issues which prevent them donating. I doubt we’ll ever know.